Shortly after my time at Activision one of the things I tinkered with, inspired by working on the Pitfall franchise, were several tools to create, edit and manage levels for Pitfall 2 which I was hoping would be Pitfall II on the Nintendo Gameboy Colour. 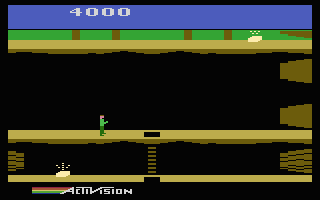 Pitfall II for GBC never happened (actually it did happen but Activision screwed around so much and wanted to pay so little it wasn’t actually worth my time finishing up Pitfall II, along with a dozen other classic Atari 2600 games that I had about 90% implemented) so I just retooled the Pitfall 2 level creation tool to allow it to re-generate the original Pitfall 2 ROM image for the Atari 2600 VCS. The ROM image here is what I would call a beta-release. It has bugs. It lacks polish. I’m the only one who has tested it, ergo it might be easier than I think it is, or I might have made it too hard. I designed the level to be harder than the original, hence the "plus" appended to the name. So go and enjoy reliving your youth, courtesy of all my pointless efforts expended on porting almost a dozen Activision games to the Nintendo Gameboy Colour. The current and only outstanding bug(s) in the game right now, that I know of, is when you collect the treasures spread throughout the level. The treasures don’t actually get collected properly, if you exit the room and re-enter the treasure will have "re-spawned." I’ll fix this when I have time after my deadline at work has been dealt with. Something you should be aware of is that the ROM image will only run on those emulators that support the original Pitfall 2. Click here to download the ROM image.